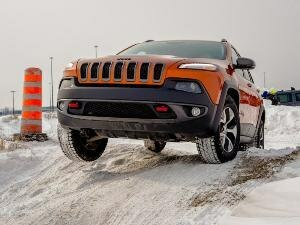 The 2016 Jeep Cherokee continues to buoy the reputation of Chrysler's prominent SUV brand by offering those shopping for a compact people mover a chance to sample genuine go-anywhere capability without sacrificing comfort or daily practicality. 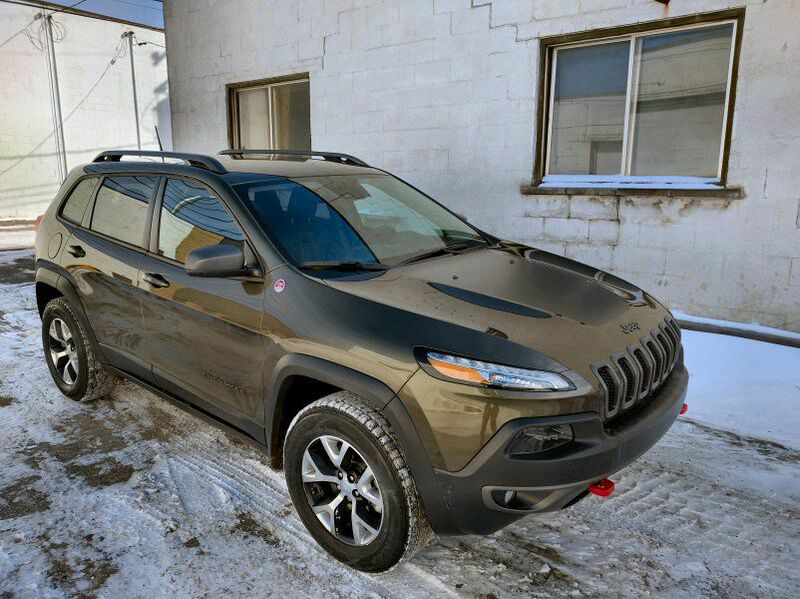 Even the versions of the Cherokee intended to ply more civilized terrain still provide the rugged and striking design of a Jeep that's not afraid to stand above the fray and distance itself from the more anonymously-styled crossovers that typically populate its price point. 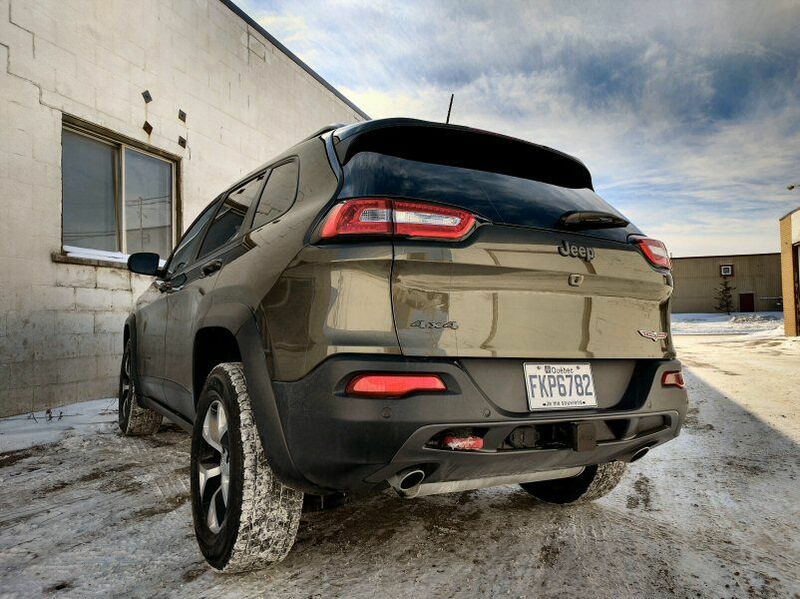 There are few, if any, SUVs that embody the same mix of outdoor adventure and on-pavement grace as the Jeep Cherokee, and especially when found in Trailhawk trim it adds a unique dimension to the family market that's well worth investigating as an alternative to standard sport utility fare. ...For passengers, is the rest of that sentence. 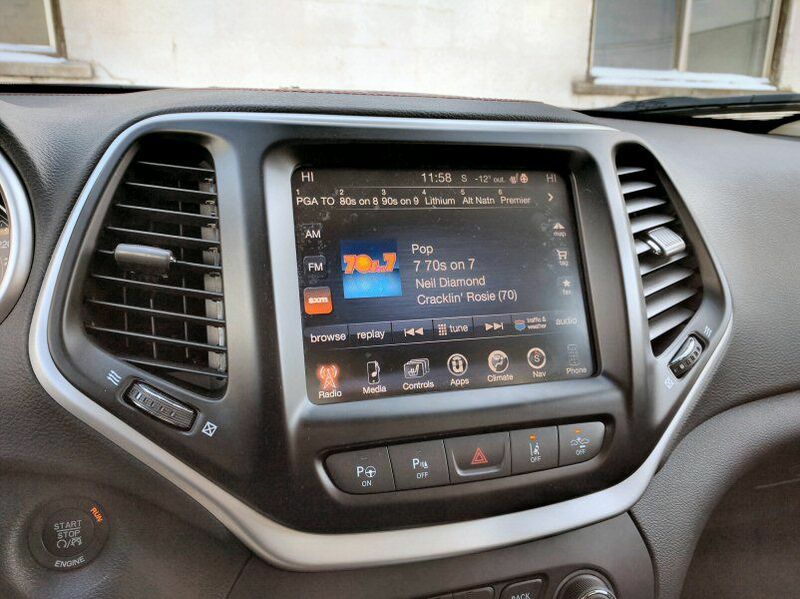 Unfortunately, the decision to prioritize people over packages means that the Jeep Cherokee's cargo compartment suffers in comparison to other small family options. The 54.6 cubic feet of total storage room offered by the Cherokee (with its rear row folded) lag considerably behind the 70+ cubes found in the Ford Escape, the Toyota RAV4, and the Subaru Forester, and this number is more than halved with a full load of passengers. 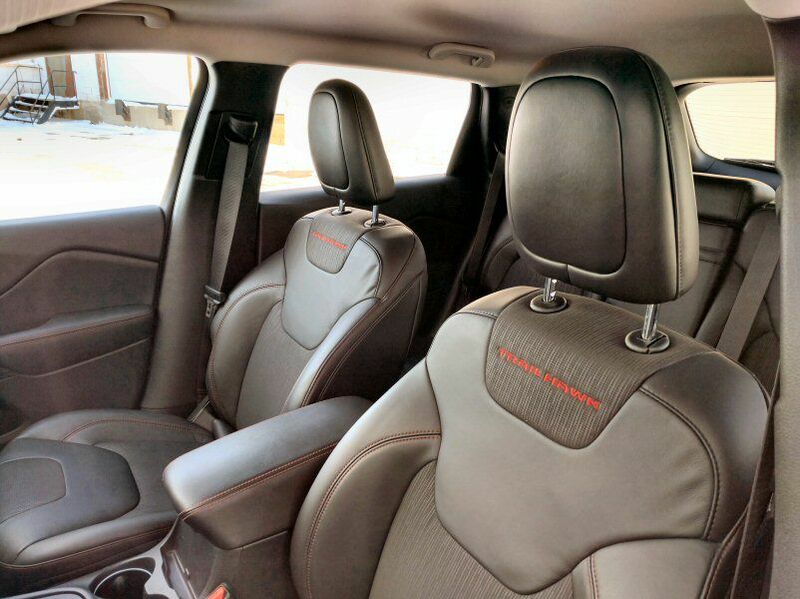 Even base models of the 2016 Jeep Cherokee can be described as well-equipped. The entry-level Sport trim includes features such as air conditioning, Bluetooth connectivity, a touchscreen Uconnect infotainment system, power windows and door locks (the latter with remote entry), while the next-step-up Latitude offers alloy rims (17 inches, just like the steel units on the Sport), tinted windows, body-color trim, interior LED accents, a unique storage compartment located inside the front passenger seat, fog lights, and a rearview camera. 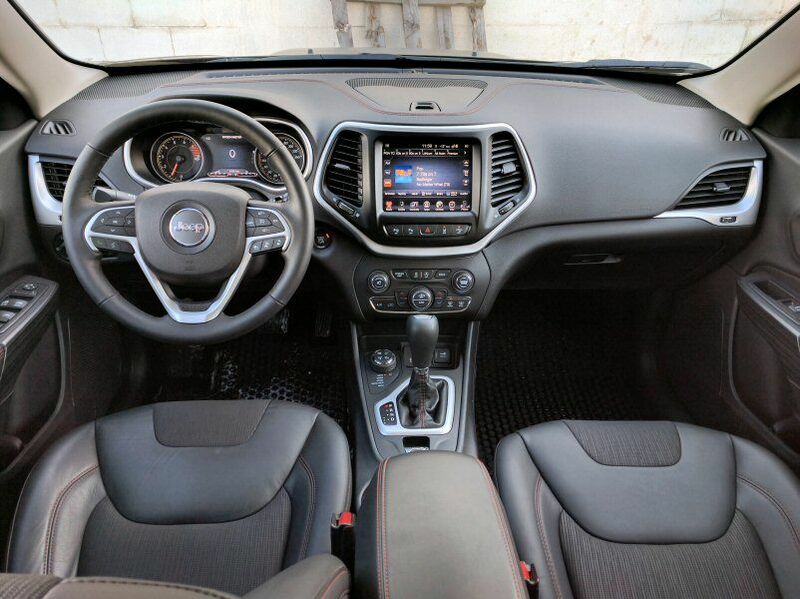 The Cherokee Trailhawk - which is the model I drove for a week - offers a host of off-road features (more on those later) alongside creature comfort upgrades like the latest (and largest) Uconnect infotainment system, special gauges, nicer plastics throughout the cabin, and a more aggressive exterior styling treatment. 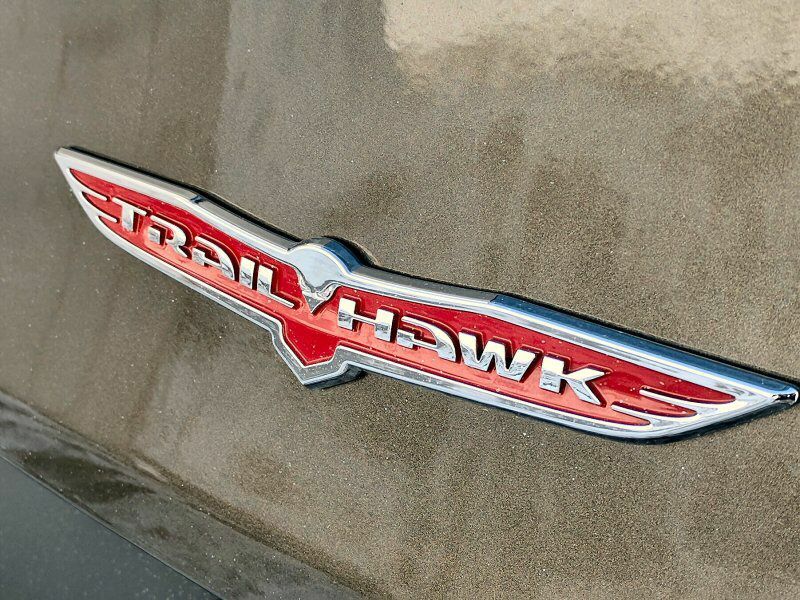 The Limited shies away from the Trailhawk's all-terrain character but otherwise builds on its gear by way of heated leather seats with power adjustments, a heated steering wheel, dual automatic climate control, a remote starter, and automatic headlights. The range-topping Overland essentially combines all of the options and packages available on lesser trims (again, minus the Trailhawk's off-road gear) in a single Cherokee edition. It's worth noting that the Trailhawk I was piloting came fully loaded with options, including all of the above-listed gear found standard in the Limited (by way of the Comfort/Convenience package) as well as a navigation system and host of advanced safety features that are part of the Technology Group package. The 2016 Jeep Cherokee is offered with the choice between four-cylinder and V-6 engines, and which one you choose will go a long way towards how satisfied you are with the SUV's driving experience. 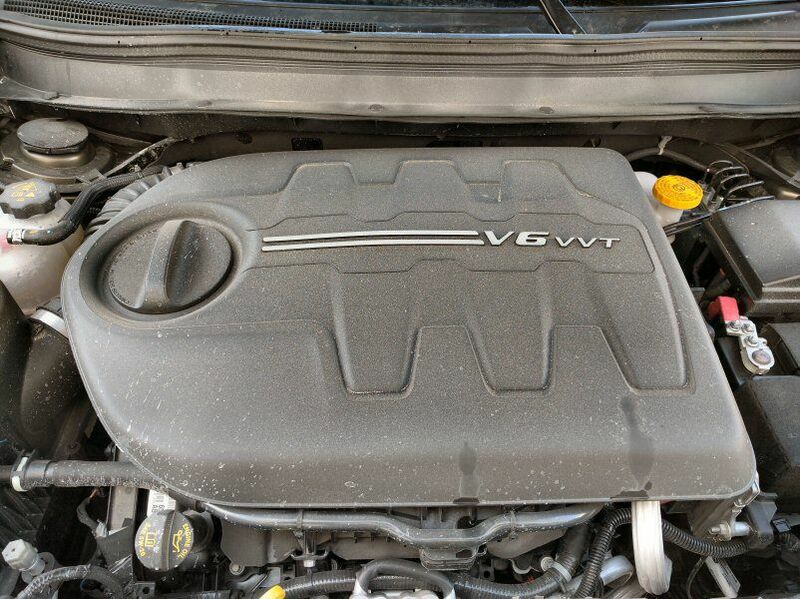 The base 2.4-liter four-cylinder motor is good for 184 horsepower and 171 lb-ft of torque - these are average numbers for its class that unfortunately are fighting against two mitigating factors. The first is the weight of the Cherokee, which can check in at up to 4,046 lbs, which is relatively hefty compared to other small SUVs. The second is a nine-speed automatic transmission that Chrysler has had to continually tweak and tune across its entire line-up in order to provide the kind of smooth shifting and accurate gear selection that customers expect from a modern vehicle. A safer bet is the 3.2-liter V-6 that's available as an option on all but the entry-level Sport version of the Jeep Cherokee. 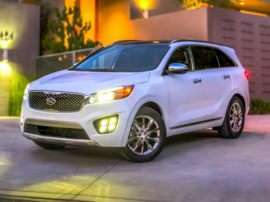 With 271 horsepower and 239 lb-ft of torque on tap, the six-cylinder SUV has more than enough grunt to keep things lively under your right foot, and the additional torque helps to paper over the transmission's occasional moments of indecision (as well as boost towing capacity to 4,500 lbs). It's an improvement over the four-cylinder Cherokee almost across the board, which makes it hard to recommend sticking with the four-cylinder motor. This Jeep is one of the few vehicles in its class still available with V-6 power, as most others rely on turbocharged four-bangers to achieve similar levels of output. The 2016 Jeep Cherokee's Fiat roots mean that all models - save the Trailhawk - can be had with a front-wheel drive layout. Should you elect to stay true to the brand's heritage and install a four-wheel drive system, you'll have the choice between two specific designs. Active Drive I is an "automatic" four-wheel drive that manages torque based on traction conditions, and is geared towards dealing with snow and slippery pavement rather than mud bogs or rocky outcroppings. 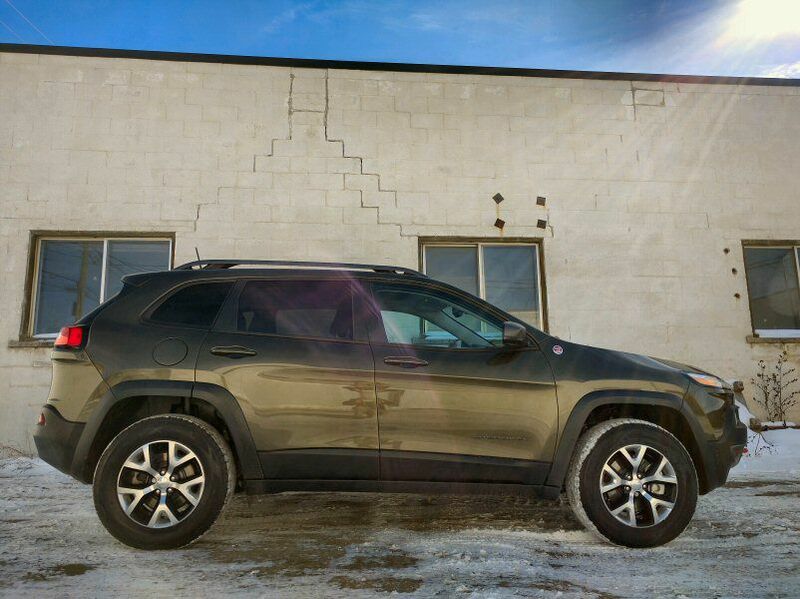 Active Drive II raises the stakes by providing a torque-multiplying low range setting that gives the Jeep Cherokee a serious advantage when it comes to parsing more difficult off-road conditions - a rarity in the compact class. 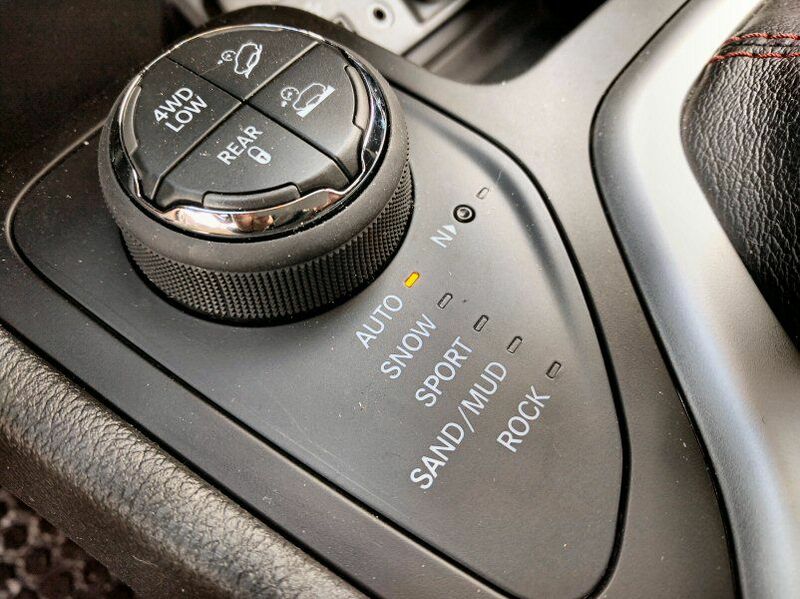 The Selec-Terrain feature, which allows the driver to customize stability and traction control parameters, engine response, and transmission behavior via Snow, Sand/Mud, and Sport settings, is included with both systems. As pleasant as the V-6 edition of the 2016 Jeep Cherokee is to drive, there are definite trade-offs that come with the larger of the two available motors. 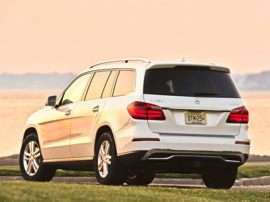 Most significant is the fuel mileage hit, which is compounded by four-wheel drive. 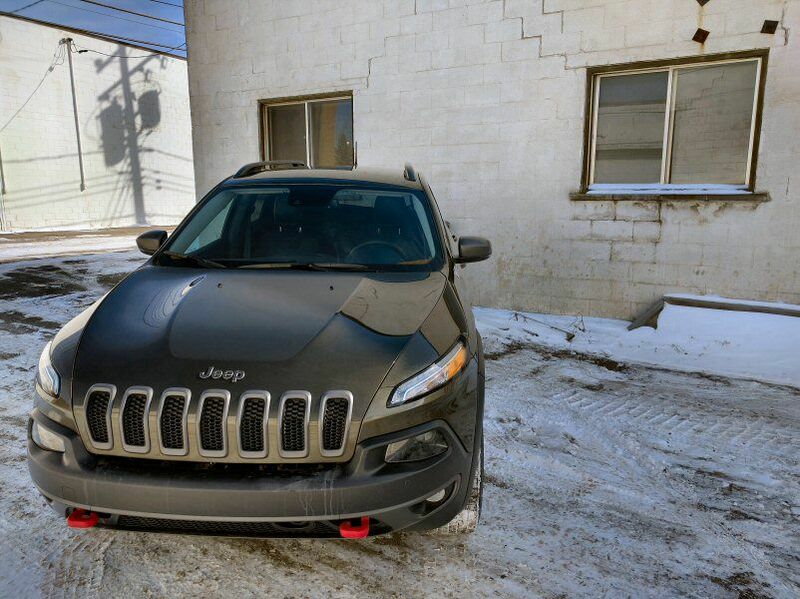 The four-cylinder Cherokee Sport returns 22 mpg city and 31 mpg highway (25 mpg combined), with front-wheel drive V-6 models checking in at 21 mpg around town and 29 mpg during highway cruising (24 mpg combined). Active Drive I drops a single mile per gallon from each of the combined measures, while Active Drive II shaves off another. The Trailhawk's more aggressive tire tread cuts combined miles per gallon to 22 regardless of which engine is selected. I can confirm the relatively deleterious effect the Trailhawk package on the V-6 Cherokee's efficiency, as I wasn't able to best 19 mpg even after incorporating a lengthy highway trip into my test loop. If you can handle the 2016 Jeep Cherokee Trailhawk's gluttonous thirst for fuel, then you'll appreciate the freedom of travel that its unique Active Drive II four-wheel drive system has to offer. 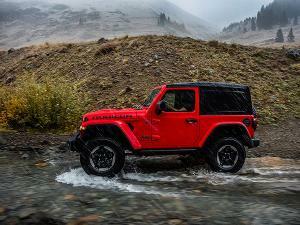 Not only does the Cherokee Trailhawk's Selec-Terrain feature add a Rock setting to assist with crawling from one boulder to another, but it also comes with a lockable rear differential that more effectively manages traction in difficult conditions, as well as a hill descent control feature. Combine this with the previously-mentioned all-terrain tires and the respectable ground clearance offered by the Trailhawk's suspension (and its protective skid plates underneath the chassis), and you've got the formula for a genuinely-capable off-road compact SUV. 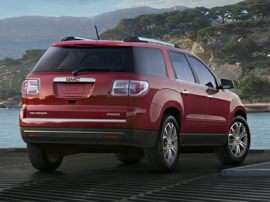 There's really no other competitor that can parse the same undiscovered country as the Cherokee in the compact segment. Chrysler has done a commendable job of democratizing its active safety equipment so that it becomes available on even affordably-priced vehicles like the 2016 Jeep Cherokee. To make the most of what's available, you have to order the Cherokee in either Trailhawk or Limited form and then check the box for the Technology Group package, which gives you a lane departure warning and intervention system, forward collision warning with automatic braking, a blind spot monitor, and a rear collision detection system that also automatically stops the SUV should a potential impact be detected. The trouble with active safety systems is that weather conditions and other factors can conspire to make them overly cautious in how they interpret the current driving situation. I repeatedly had issues with the rear automated braking feature, which at one point activated several times in a wide open parking lot while I was reversing out of my space, jarring the vehicle to a halt despite no obstacle in sight. This also happened at several other points during my time together with the Cherokee, which made me wonder how much of an impact the sub-zero weather was having on the seemingly-clear sensors mounted in the back bumper. As I mentioned earlier, it's difficult to think of another compact SUV the provides the same mix of genuinely comfortable daily driving with high levels of off-road talent. Amongst the cast of usual suspects there's really only the Subaru Forester that makes a legitimate stab at all-terrain anything, largely due to its tall ground clearance (8.7 inches) as well as the new X-Mode feature for its all-wheel drive system. Still, X-Mode is no substitute for low-range gearing in any number of sticky trail situations, which means you have to go up a class to encounter anything like what the Jeep Cherokee Trailhawk (MSRP $30,995, a $7k jump over the base model) has to offer. With the Nissan Xterra and the Toyota FJ Cruiser now extinct, that leaves vehicles like the Toyota 4Runner and Jeep's own Wrangler as possible alternatives, neither of which provides anything close to the modern suaveness exhibited by the Cherokee. If you're willing to spend a lot more money, then there's always the Land Rover Discovery Sport (starting MSRP $37,445), but again, it's difficult to imagine a scenario where luxury buyers are cross-shopping at the shallow end of the Jeep pool.